As an direct PA. full agent we are able to provide instant, permanent registration, not the temporary pink slips used by other agents (Sundays are an exception, as Penn D,O.T. is closed for online transactions due to maintenance).Sunday transactions will be done on paper forms, you will receive a plate(if required) and a 90 day temp. registration (if required) . The permanent registration will be issued the following business day using the PENN. D.O.T. system and be available for pick up, or mailed to you if requested a time of service. ​Dealer services for title work also allows us to provide a detailed report of each transaction, including taxes paid and the plate that was assigned for ALL dealers in and out of state. It also allows immediate verification of the lienholder against the title. ​Services include: Issuing new tags and titles, Transferring tags from one vehicle to another, Registration Renewals, Reissuance of lost registration cards, stickers, tags, weight class stickers, etc., Changing addresses on drivers licenses and vehicle registrations. 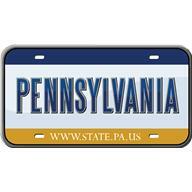 ​Come to one of our offices when you need any Pennsylvania Department of Motor Vehicle transaction. We will register and or title cars, all trucks with or without Combination weight rating, trailers, motorcycles, special mechanical equipment (SME) skid steers, backhoes graders, and like equipment, municipal vehicles, fire department, EMS services police vehicles, mopeds, school buses omni vehicles , motorhomes, buses, boats, canoes/kayaks, ATV's and snowmobiles.